What Makes The Wet Shaving Academy's Shaving Courses Unique? 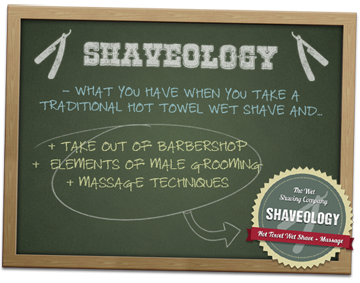 Why Choose Our Shaving Courses? There are lots of wet shaving courses available and potential students can get confused by the differences in length, number of shaves performed and cost. 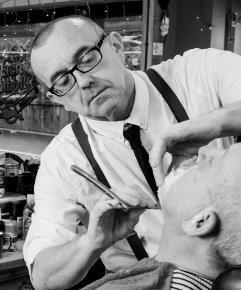 I get asked a lot ‘Why should I choose your course over one that is shorter and cheaper?’ In this article I’m going to give you the reasons as to why I think you should pick The Wet Shaving Academy’s shaving course. Firstly, a little about me, Patrick Bryan. I’ve been a masseur for over 20 years, a shaveologist for 10 and a tutor for two. I’ve enjoyed shaves everywhere from high class barbers in Mayfair to tiny, hole-in-the-wall barbers in India. One thing I’ve learned is that although the quality of the shave is, obviously, very important, the difference between a good shave and a brilliant, memorable shave can be as little as a couple of minutes scalp massage, or sitting in a barbers chair with a vivid pink face pack on. Perhaps it’s the therapist in me, but those little touches elevate a purely functional shave to the level of a relaxing treatment. These are the extra little touches that I love to teach. How do I teach you to master this age old skill? My course is taught over two intensive day, during which you’ll get to perform between eight and ten shaves. Why so many, when there are shaving courses out there on which you’ll only need to do one shave? There are two elements in giving a great shave – competence and confidence. Doing one or two shaves on a course might give you a degree of competence with the razor, but your confidence is going to be a very fragile thing. If the shave(s) you did were on young, thin faced guys, you will find it very different giving a shave to an older, greyer, baggier faced bloke! If you then mess it up and give him a few nicks this can destroy your confidence. I know this to be true because I frequently have to retrain people who’ve done one or two poor shaves, have lost their confidence completely and have given up shaving. This is why I insist on so many shaves – so we can cover old, young, fat, thin, grey, coarse beard, dense beard, sparse beard, even guys who’ve shaved the day before (which is very different from shaving some with 3-4 days growth). By the second afternoon of the course I’m usually pretty bored because there’s nothing for me to do! All the students are by now giving great solo shaves and I know that they will be able to carry on with this on the hardest shave they’ll do – the first one when I’m not there! Nearly half of my students are female. While I don’t hold any prejudices against women shaveologists I have a few white knuckle shaves from them. This is down to way they were taught. It’s almost impossible to teach someone to do something when they have no idea what it should feel like. To combat this all of my female students now get a ‘shave’ first thing on their courses. Hot and cold towels, lather and a shave (with a razor with no blade in it, of course). This simple thing means that all the following teaching, particularly stretching the skin tight and the gentleness of the shaving strokes, makes perfect sense. The shave routine I teach is adapted to be comfortable for each student. The massage therapist in me is very aware of peoples posture, and we work together to find comfortable, safe ways of performing the shaves. The same goes for women who can sometimes be a bit uncomfortable getting that close to a stranger. Another thing I’m very keen on is not teaching a ‘one shave fits all’ routine. We spend time before each shave face mapping, looking not only at direction of hair growth and hair density, but also scar tissue, moles and blemishes and decide how we need to adapt the shave accordingly. 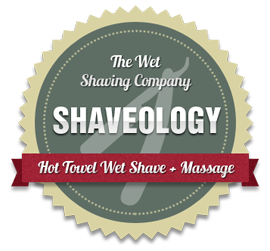 Where do we teach our wet shaving courses? So, that’s the functional side of the shaving course. We’re also very adaptable on the practical side of things. We do have a centre in Winchester, Hampshire, that we run courses from, but the vast majority of our students prefer to train in their own salons. There are several reasons for this. I’ve found that people learn quicker in familiar, comfortable surroundings. It’s also helpful to see and feel how the shaving is going to fit into your space. The fact that we’re on your home turf allows you to start creating the buzz and promotion about your new service while you’re training. You can even get your local press involved. One barber put a picture on Facebook of him doing a shave and within hours had over two hundred likes, comments and enquiries! But the biggest advantage trainees find is with supplying their own models. Not only do a large proportion of these go on to be regular paying customers, but they are a fantastic source of feedback when doing practise shaves. Occasionally getting models during the working day can be a problem. If you know you’re going to struggle we can arrange the course for late afternoon/evening, 4-10pm. Once the course has been confirmed and deposit paid you get a course timetable, so that you can start to book models, and a course manual. This manual covers all the health and safety considerations plus equipment lists. I usually advise students not to buy any equipment before the course. I will bring everything we need from barbers chairs, through towels and steamers, to razors, brushes and products. I have a big selection of razors and brushes so you can try different types to find which suits you before you buy. I’ll also discuss with you before the course exactly how you the shaves are going to fit in to what you do now. For example, if your workspace is small, or you do mostly mobile work, then it’s probably best that you learn to shave on a massage couch, which I will also bring. I hope that this has given you a good insight into how we have designed our shaving courses with one aim – to give you the best training in wet shaving, adapted to fit your needs. If you’ve got any questions, general or specific, please feel free to call, message or email Patrick. If you are interested in attending a Wet Shaving Course with us, please don’t hesitate to call Patrick Bryan on 07723 091845.